Ever since the Korean Society of Costume (KSC) was established on December 5, 1975, it has been an active center for scholars of costume fields for over 40 years, providing new perspectives for scholarship and a space for sharing information. 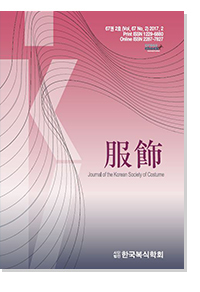 Since 2012, our academic journal, Journal of the Korean Society of Costume (복식 服飾, JKSC), began publishing eight times a year, in January, February, April, June, August, September, November, and December, up from just twice a year in 1994, three times a year in 1995, four times a year in 1996, five times a year in 1997, six times a year in 1998, and ten times a year from 1999 to 2011. Since 2001, our English language journal, International Journal of Costume and Fashion (IJCF), has been published biannually, in June and December, and with the sponsorship of the Korean Federation of Science and Technology Societies (KOFST), KSC is in the process of developing its online services to provide digitization of abstracts, online membership and management, and full-text articles dating back to 1999. KSC is also hosting an annual Spring Conference in May along with a costume exhibition (KOSCO Costume Exhibition) and the Fall International Conference in October. During these academic conferences, papers will be presented in oral and poster sessions on the academic divisions within Korean costume, fashion design, dress aesthetics, clothing construction, the social psychology of clothing and fashion marketing . The Exhibition includes historical costume, art to wear, and art product. Through these events, KSC remains dedicated to promoting fellowship among its members. Additionally, the International Association of Costume, established by academics from Korea, Taiwan, and Japan in 1982, regularly holds a biennial International Costume Congress (ICC) hosted in turn by each country. To encourage wider participation and expand perspectives, ICC has also been held in other countries, including Portugal, Denmark, the UK, and the United States. ICC aims to promote research and academic exchange and introduce new trends in costume studies, as well as promote camaraderie among its members. To this end, Seoul hosted the 11th ICC in 1992, the 17th in 1998, and the 24th in 2010, while the 21st conference was held on Jeju Island in 2004. We are now eagerly looking forward to hosting the 27th ICC in Seoul in 2016. KSC is dedicated to doing its best to strengthen ties with other academic societies and research institutes, as well as to promote academic and industrial collaboration and mutual benefits and progress both among fashion designers and within the fashion industry in Korea.